At Urban Massage we believe wellness services are not a luxury. They are as important as a wholesome diet and regular exercise in keeping a healthy body and a happy, focused mind. Our mission is to make wellness services accessible for all those living in a busy urban setting, so that they can receive a personalised, professional massage service, at their convenience. Create an account through urbanmassage.com or on the Urban App (available on iPhone and Android). Enter your unique 13 digit code in order to redeem the value of your voucher against the treatment of your choice. Any remaining credit will stay in your account for 12 month(s), and will be applied to your next purchase. 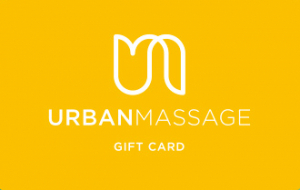 Urban Massage gift vouchers can be used to purchase Urban Massage Treatments. If the treatment purchased total less than the value of the gift voucher, any balance will remain on the gift voucher and will be redeemable against future bookings. Change in the form of currency or credits or credit or debit cards cannot be provided. Gift vouchers cannot be exchanged for cash.